A comfortable home is a secure one. No matter how safe your neighbourhood may be, investing in a strong, durable and reliable fence will help prevent unwanted incidents. It will also help maximise your property value. Not only that, but a good fence should balance a need for privacy. Many homeowners want to keep their homes reasonably private, without the interference of prying eyes. Here’s a look at some ways fencing will keep your home and your family safe. What Do Good Gates and Fences Need to Have? The first two properties are reasonably intuitive. Having a tall fence that is difficult to climb over will discourage the majority of intruders. Generally speaking, intruders are seeking to exploit vulnerabilities, rather than expend extra effort. Similarly, you’ll want a fence constructed of strong, reliable materials to prevent vulnerabilities from appearing in the first place. These materials should be weather and rust proof. This is important because your fence will exposed to the elements on a daily basis. You don’t want to have to constantly inspect and maintain your fencing for vulnerabilities. This is both a waste of your time and your money. For instance, once rust sets in around a crucial joint such as a gate lock, it becomes infinitely easier to exploit and break through. This putting you, your family and your entire property at risk. However, the following two points may not seem as obvious. While privacy is a right and a reasonable expectation, the only way to ensure complete and total security is to maximise visibility of your property and the surrounding area. This will allow you to monitor the area for intruders, at the cost of some privacy. However, when set up correctly, this can help your home feel a lot more welcoming and aesthetically pleasant. Lastly, ensuring that your fence is securely rooted to the foundations will minimise the risk of it toppling over, or animals trying to dig under it. Automated gates are exceptional when it comes to security. Plus, they offer a sleek, modern aesthetic and are great for both side and back entrances. Automated gates are powered by motors that control the movement of the gate. They can be set up with control panels that allow you to control the gate remotely from the safety of inside of your house. This way, you can only let in the people you want to see. Gates with electrical components can also include custom lighting solutions. These lights are activated by sound or movement, heightening the security of your property. You can even fit these gates with cameras to precisely monitor who’s entering your property. These gates can be fitted to a match a number of architectural styles and existing fences. It’s recommended that you make a significant investment in materials that are durable and weather resistant, as this will cut down on repair and maintenance costs in the future. Made from steel tubes, these are a relatively straightforward, tamper resistant option to maximise security. Plus, you don’t have to compromise at all on aesthetics. Tubular fencing even comes at a very modest price point. This gives you the budget to splurge on other security maximising features like an automated gate or extra lighting. Aluminium slats are all about providing a very crisp and modern finish to a fence. These slats can be finished in a whole range of ways to resemble a range of materials (wood finishes in particular are very popular). Similarly, aluminium slats are incredibly durable and tamper-proof, requiring almost no maintenance throughout their usage. These can be fitted to any area around a property, but are particularly great for areas that require more privacy, such as a pool or lounge area. Spear top fencing is a perennially reliable deterrent. 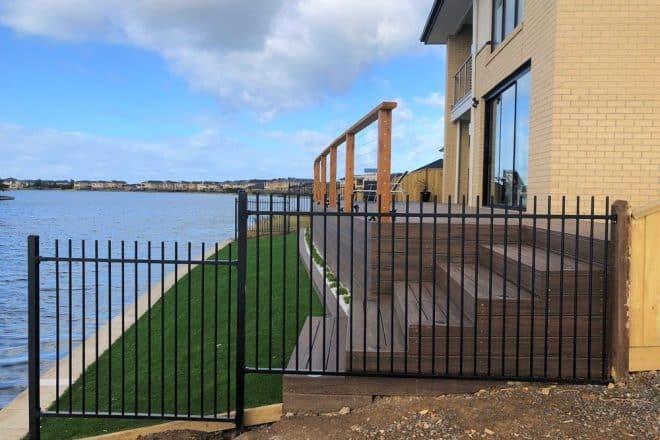 A more traditional, heritage style of fencing, this option will maximise both visibility and make intrusion incredibly difficult. However, it still looks fantastic and secure, so you’re won’t be sacrificing on aesthetics at all.